The more you do the more you can do! I so believe this and, of course, the opposite is true as well! The less you do the less you can do. I think this principle holds true in all sorts of situations, not just exercising. For example: Because of my brain tumors, I’ve had periods of time when it was hard for me to focus or concentrate for long periods of time. Not so good if you’re writer like me. During those times, I created what I call my “50 word club.” I would force myself to write at least 50 words on a new story. Sometimes that’s all I could write but the more I was faithful to doing that the more I could write. Sometimes it would be 100 words and then it might be 10 minutes of writing which led to 15 and 20 minutes. The more you do… the more you can do. At this point you may be saying, “so what does this have to do with God?” John 10: 10 says, “the thief comes only to steal and kill and destroy; I have come that they may have life, and have it to the full.” The King James Version says to have it more abundantly. God wants us to have a full life–an abundant life, but life has a way of knocking us down. 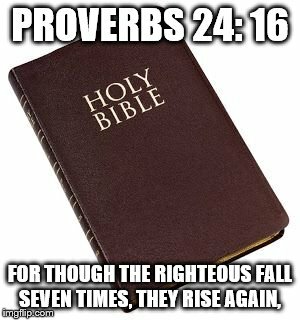 Proverbs 24: 16 tells us that righteous my fall but they rise again. The more you do… the more you can do. YOUR TURN: Share an example from your life where this principle worked. Thanks!